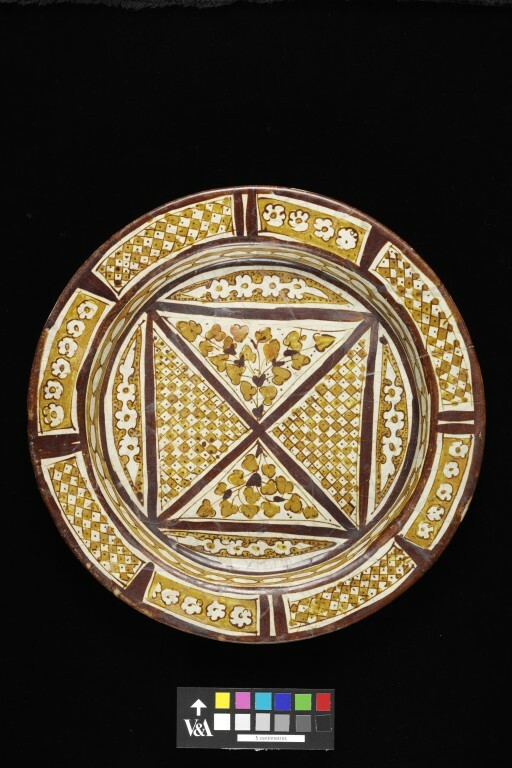 This large, flat dish has lustre decoration in yellow and brown. Experts think this two-colour combination, seen also in some contemporary glass, represents the earliest phase of lustre production in ceramics. Potters in Iraq invented the technique of lustre decoration on ceramics in the 9th century. First they made a glazed vessel or tile with little or no decoration in the normal way. When the piece had cooled, a design was painted over the glaze in metallic compounds. The pot or tile was then fired again, this time with a restricted supply of oxygen. In these conditions, the metallic compounds broke down, and a thin deposit of copper or silver was left on the surface of the glaze. When polished, this surface layer reflected the light. Dish after a metal shape, buff-coloured earthenware (fritware), flat with wide, broad rim, covered in tin-opacified white glaze, painted in yellow and red lustre (bi-chrome lustre), the design divided int oa simple quadrant with triangular panels each filled in with further patterning, foliate or geometric, probably inspired by engraved or repousse work on metalwork. 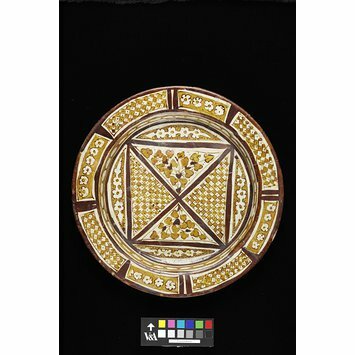 Dish, whiteware, with geometric design decorated with bi-chrome lustre; Iraq (probably Basra),ca. 850. Like the glass cup below, this large, flat dish was painted in two colours of lustre, yellow and brown. This combination is thought to represent the earliest phase of lustre production in ceramics. An important innovation by Iraqi potters was the use of metallic lustre to decorate their whitewares. Like some contemporary glass, this large, flat dish was painted in two colours of lustre, yellow and brown. This combination is thought to represent the earliest phase of lustre production in ceramics.